After awaking, our French host Eudora cooked us breakfast. We filled out our safari review surveys online and lodge owner Jonathan let us use one of their computers to confirm our flights. I even checked my email wirelessly on my iPod. Reluctantly, we said goodbye to our Welsh friends John and Jane who left at 9 a.m. for the airport and Zanzibar along with their son, Huw. I helped our Kiwi friend Elaine with her evaluation and broke the earthquake news to her from Christchurch. She was naturally worried about her family and friends back home. We said goodbye to guide Emil and driver Joseph (who arrived to pick up Emil). We then left for the airport together and paid US$ 20 each for the taxi. Along the way we saw several wedding parties and almost had a crazy driver collide with us head on after he tried to pass seven cars at the last minute. Jeff buried his head in his hands and I am glad I didn’t see it. We also passed through a police checkpoint. Driving in Africa is not for the faint of heart! After arrival at Kilimanjaro Airport, we went through security where we then shopped, filled out our exit cards and said goodbye to Huw and Elaine (both were on the same KLM flight to Amsterdam and on to London at 20:45 p.m). We departed on our small prop Kenya Airways flight. We left on time with no more than 12 passengers on board for Nairobi. Curiously there was no flight attendant but an ops tech seated behind the pilot and copilot. As we entered, we grabbed a bag lunch and water was in the chest in the back. 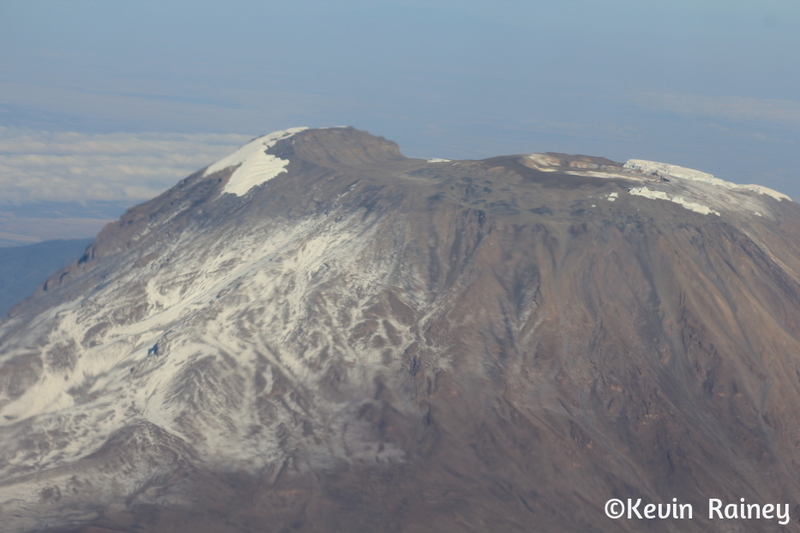 After a very bumpy flight and seeing Kilimanjaro shrouded in clouds and Mt. Kenya, we arrived at Wilson airport in Nairobi. There we received our 24-hour transit visas and took a taxi through “Nairobbery” to the Sarova Stanley in the central business district. Nairobi is the largest city in east Africa and the transit and commercial hub for the region. The name is derived from the Masai word for cool waters, which the Masai people gave to a water hole known as Ewaso Nyirobi. In modern times, the sprawling, cosmopolitan city of Nairobi combines the first-world glamour of reflecting-glass skyscraper buildings with abject developing-world poverty. The city originated in 1899 from a handful of shacks that marked the end of the railhead during the building of the Uganda railway. Due to big game hunting bringing tourists from Britain, the city expanded dramatically in the early 1900’s. A large number of British nationals settled in the area, prompting more growth and this angered both the Masai and Kikuyu people, as they were losing hunting ground due to the expansion of the city limits. The friction increased and eventually led to the Mau Mau uprising, which saw Jomo Kenyatta, the future president jailed. Kenya was granted independence from Britain in 1963, with Nairobi as the capital. Nairobi is also the diplomatic base for many counties in Africa, with its broad spectrum of international embassies and headquarters for the United Nations, multi-national companies, non-governmental organizations (NGOs) and press correspondents. It’s also the center of the growing safari business of East Africa. After passing through heavily armed guards and lowered security gates, we walked into the Victorian classic hotel. We checked in and went to our room to watch Al Jazeera and La Vuelta a España on MM2. We opened the windows and listened to the sounds and smells of Nairobi. Later, we checked the bar restaurants and arcade mall inside the Sarova complex before going to the infamous Thorntree Cafe to have supper in the cafe with live music. I had a halal pizza with lamb, beef and goat and a vanilla milkshake. 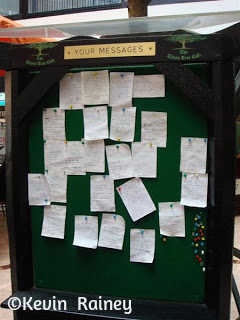 Still to this day, travelers pin their travel notes on the tree’s bulletin board, which is also the name of Lonely Planet’s travel forum. Jeff and I then read the interesting notes around the tree and posted our own regarding going to Lobo. One American had posted that he was glad to see the tree had survived in the digital era and he was posting since his last visit 40 years earlier. We went upstairs to the seventh floor to check out the veranda pool and another restaurant before returning to our room. The place had several armed guards on each floor and a lot of history and historic photos in the lobby. Queen Elizabeth 2 stayed here shortly before being crowned when King George VI died. Tonight was our last night in east Africa. We went to bed early because of our early morning flight on Sunday.